The three people spoke on the condition of anonymity because they were not authorized to discuss details of the meeting. Senate Democrats hope they will be able to finalize an arrangement with Trump by December. He confirmed during the exchange with reporters at the White House that the issue was discussed during his meeting with congressional leaders on Wednesday. Another person familiar with the meeting said Vice President Pence is open to changes he considers in line with the “Gephardt Rule” — a parliamentary rule making it easier to tie raising the debt ceiling with Congress passing a budget. The rule is named after former House majority leader Richard A. Gephardt (D-Mo.). 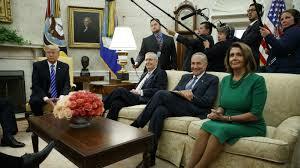 The deal comes after Trump sided with Democratic leaders Wednesday on a plan to temporarily raise the debt ceiling and fund hurricane relief, rejecting a Republican plan and vexing many in his party. House Speaker Paul D. Ryan (R-Wis.) said at a news conference Thursday that he opposes scrapping the debt-limit process. Article 1 of the Constitution sets up Congress’s powers, giving it the authority to write and pass legislation and appropriate government money. If the debt ceiling isn’t raised, investors have warned that the stock market could crash because the government could fall behind on its obligations if it isn’t allowed to borrow more money. The discussion between Trump and Schumer came during an Oval Office meeting that included other congressional leaders. At the meeting, they agreed to suspend the debt limit until Dec. 8. If Congress approves that suspension in the coming days, then they will have to revisit the matter again soon, potentially setting up another difficult vote for lawmakers. The Treasury Department can use emergency powers to avoid defaulting on its debt, such as delaying certain payments. This means Mnuchin won’t run out of cash on Dec. 9, and probably will have several more months of flexibility before the issue will have to be revisited. But Senate Democrats are hoping to coalesce around a new process for authorizing spending that takes out these frequent debt-ceiling votes by December. They would have to receive support from congressional Republicans before any idea could be authorized. Many conservatives view regular debt-ceiling votes as an opportunity to drive their message that the country continues to rack up debt, which they consider a dangerous trend that could eventually damage the U.S. economy. The issue is also one of a handful of must-pass bills that Congress has at times used to win concessions on fiscal policy issues. Sen. Rand Paul (R-Ky.) was one of several Senate conservatives who said abandoning that power would be misguided.